I’m always fascinated by Indian food, but it’s a tricky art to master I find. In theory, it’s straightforward enough and in fairness, I make a fairly passable curry these days after a lot of trial and error over the years. 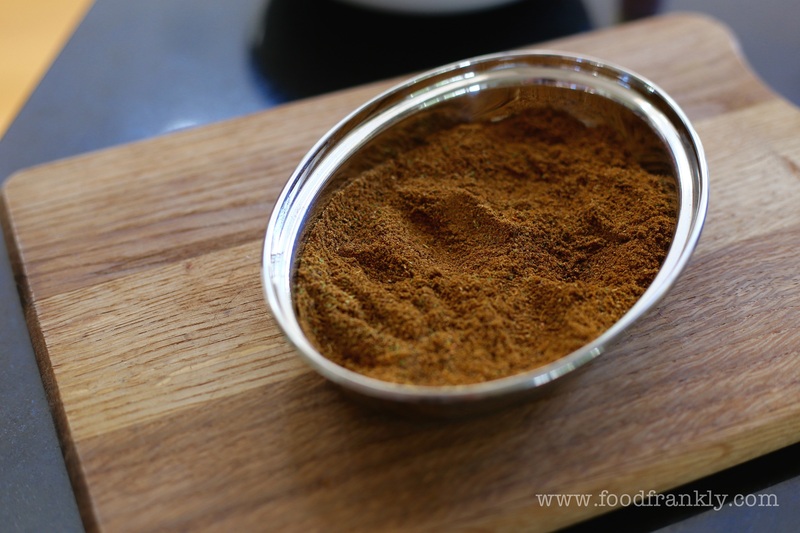 When it comes down to working with the spices though, it’s alway a little bit more difficult. There’s such a bewildering array to potentially combine, each in differing quantities that themselves vary between the regions, that it often seems fairly impenetrable to the fair-weather Indian food cooks like myself. I tend to stick closely to the experts recipes when going away from my own limited repertoire. It must be said, I tend to go through food fads and cycles, veering erratically along the culinary pavement like a pay-day drunkard at kicking-out time. At the moment it’s Indian food though, so when I caught this on Saturday Kitchen, I knew I had to give it a go. Seeing as it was also by Atul Kochhar, a chef whose restaurant I’d love to try if we manage to get down to London in the near future, that was – as they say – that. 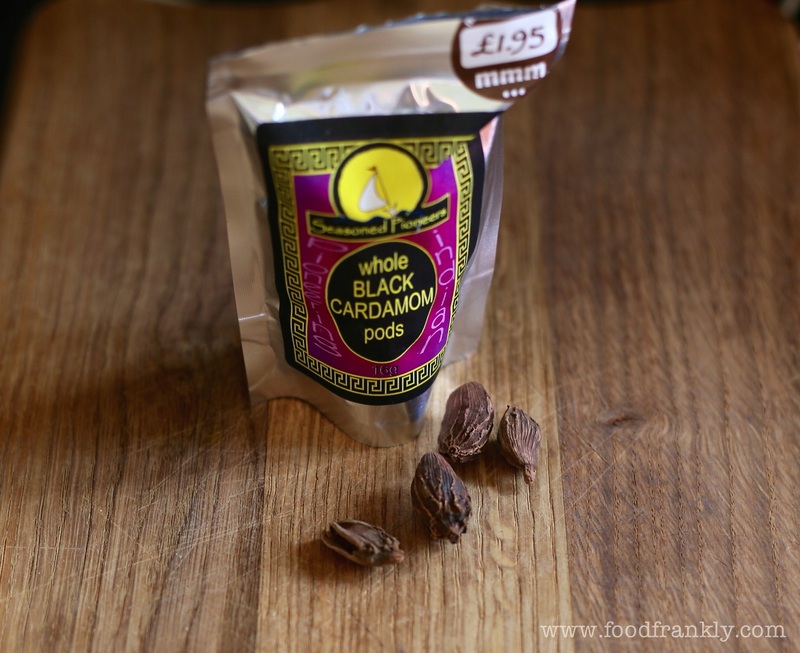 Thankfully, the spice list doesn’t include anything too obscure for my local shops and the only thing I had to hunt down was the black cardamon, which I’d never used before. It definitely added a distinctive smokiness. 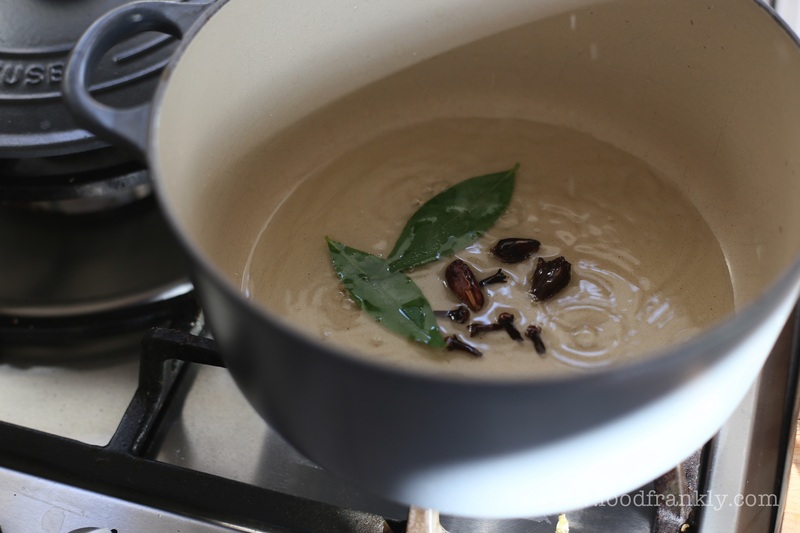 It needs a bit of pre-prep as using dried chickpeas need an overnight (or all day at least) soak before boiling them. 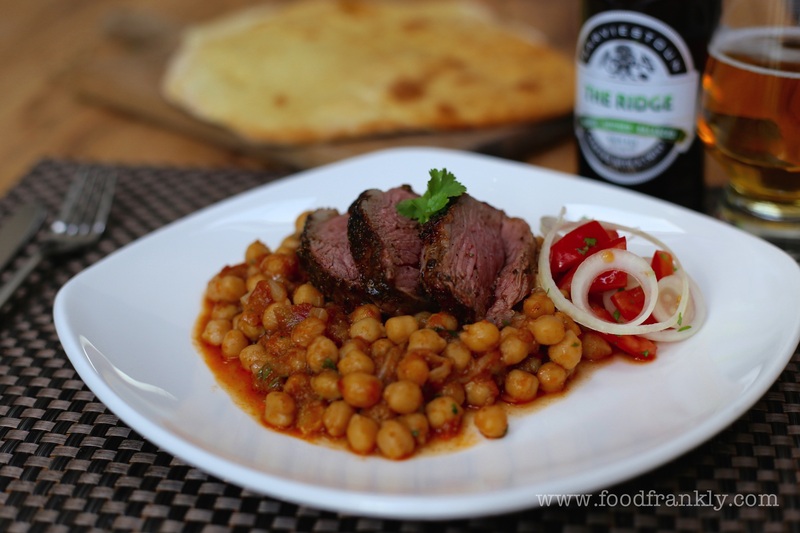 It was a lovely combination with quite powerful spices flavouring the lamb. I did try it with some chicken too, as an ‘insurance policy’ for Helen who has a love/hate relationship with lamb, but it didn’t work as well – it was too strong. I’m not normally a recipe person, I get far too impetuous to follow stepwise instructions, but I didn’t dare mess with this one. Glad I didn’t in the end, although I did it in a slightly different order. So that said, you can find the original recipe on the BBC Food website. Please do click it, it saves me typing it out if nothing else…. Start by cooking the chickpeas in the spices. They take a good 30-45 mins. 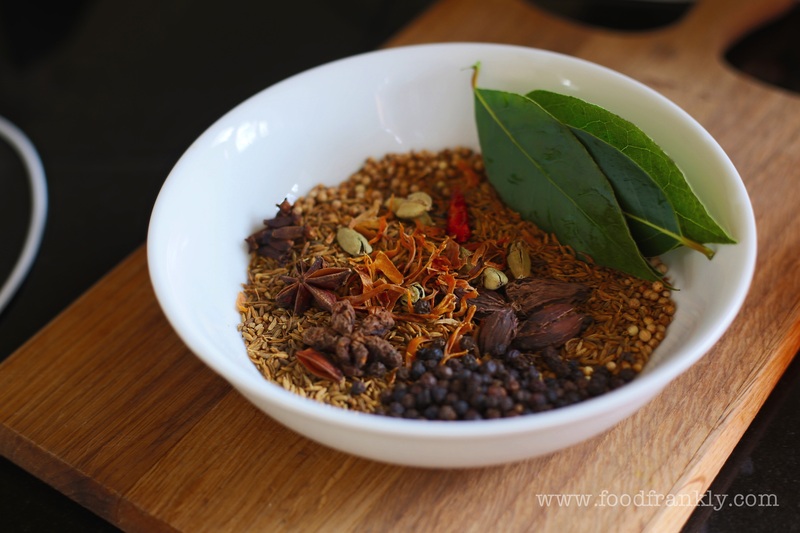 Now, to the business end – assemble your spices! Dry fry them in a hot pan for a minute or so and set aside to cool. 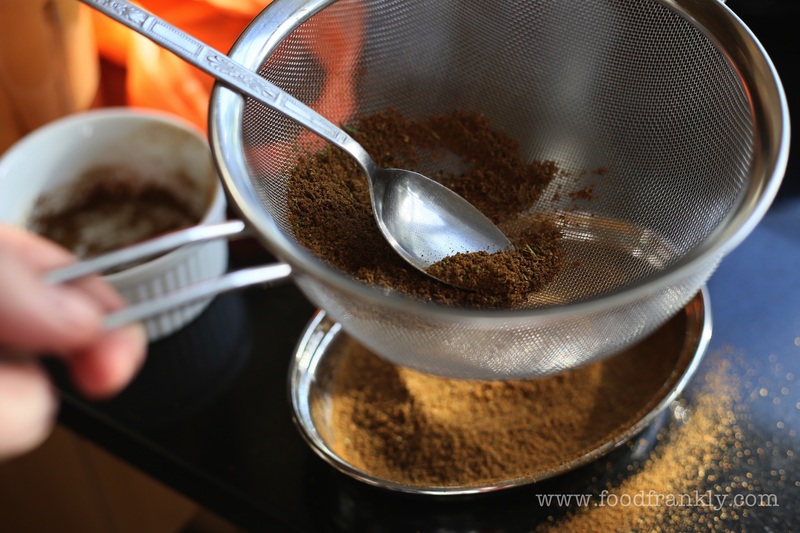 Blitz them in the coffee grinder and sieve them. The sieving was new to me, but fairly obvious really in hindsight. 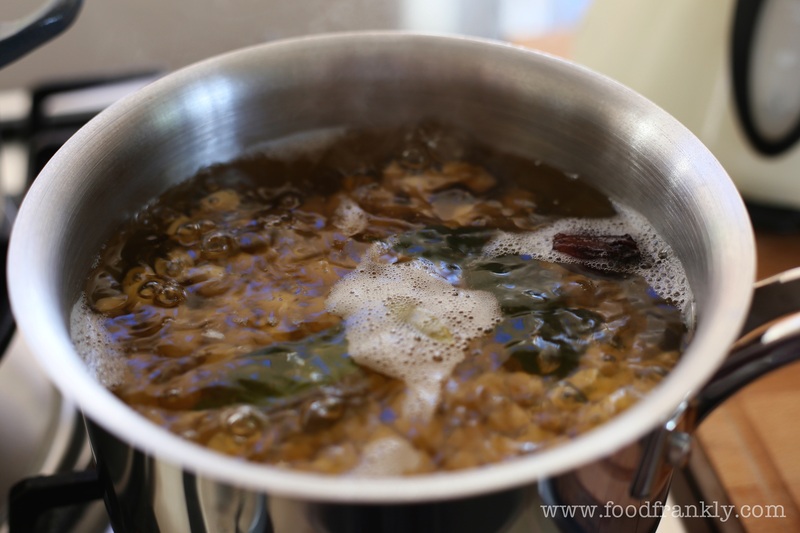 In heavy pan, fry some whole spices in a disconcerting (but necessary) amount of oil. 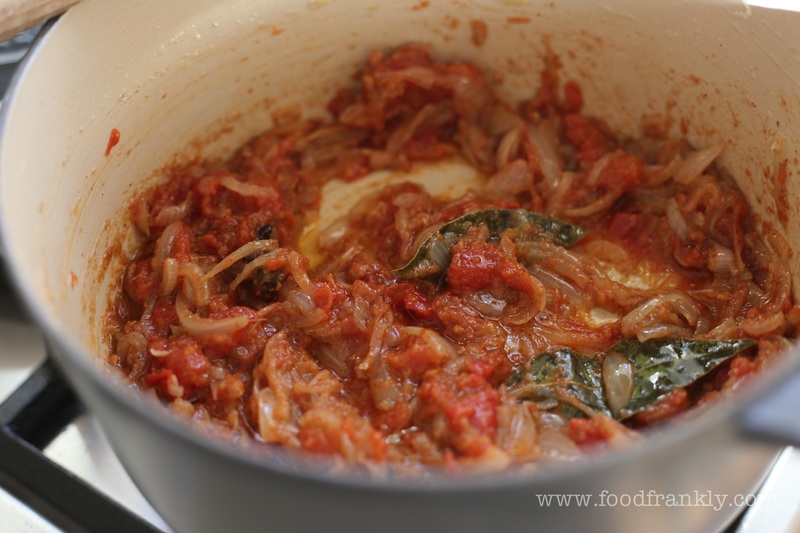 Sauté the onion until very soft and add the rest of the ingredients. Add the chickpeas and some water to cover and remember to take a picture. 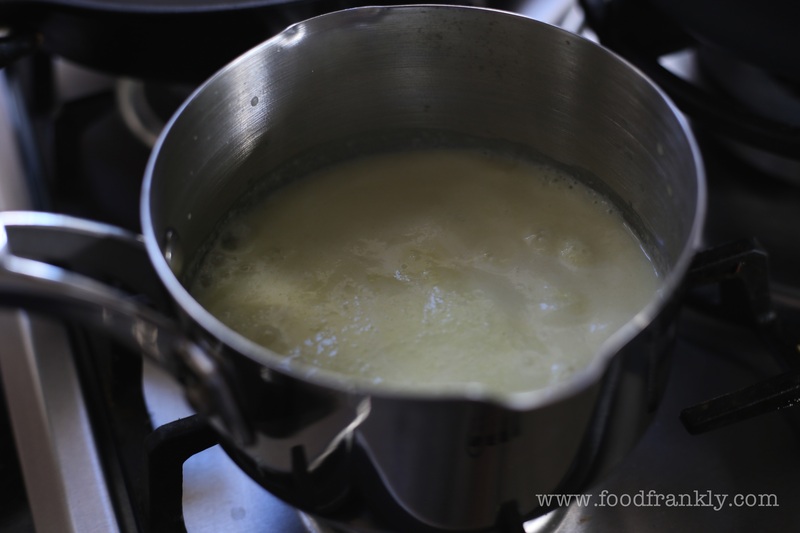 Reduce to make the thickened sauce. 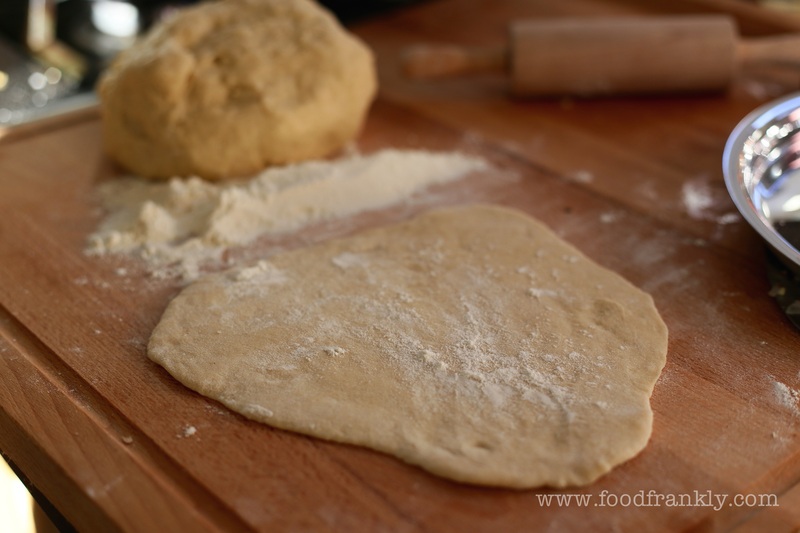 Make the naan bread indigents and roll into appropriate shapes. Bake them on a pizza stone in a hot oven and keep warm. 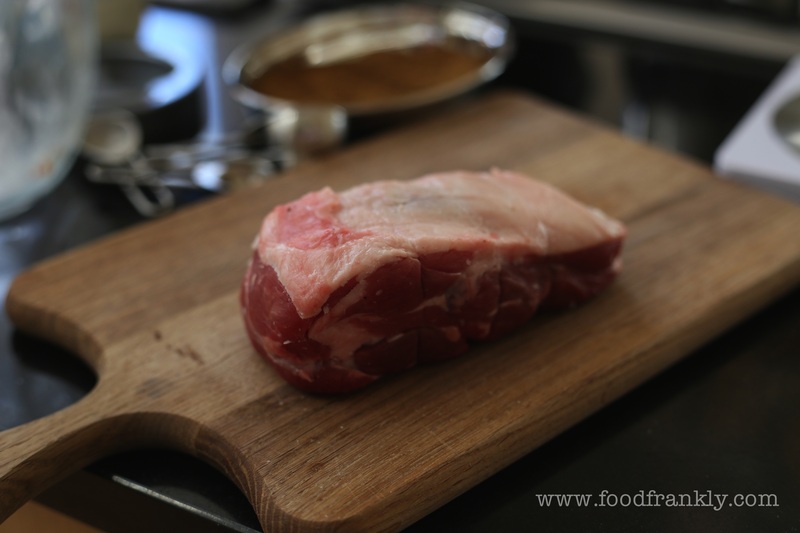 Take the lamb rump, and seal it well on the BBQ (or in a pan if using the oven). 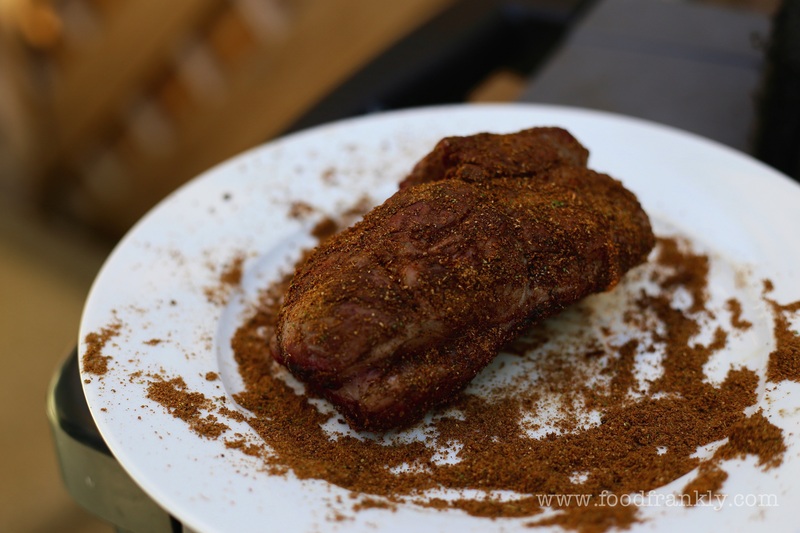 Roll the lamb in the masala spices and place back on the BBQ/Oven. 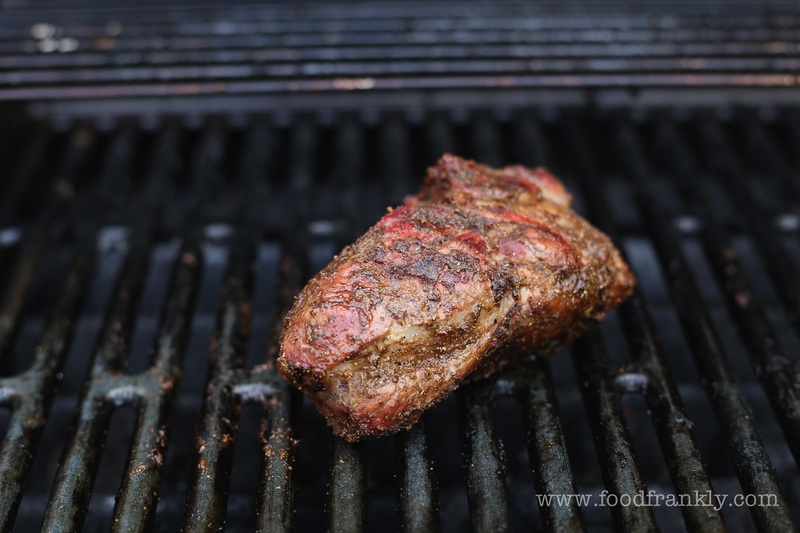 I like it quite rare, so it took only 15 minutes on all sides on the fairly inconsistent gas grill. It won’t take that long in the oven. Leave it to rest. Smells amazing, I promise you. Combine the whole lot with the garnish and enjoy. I certainly did. 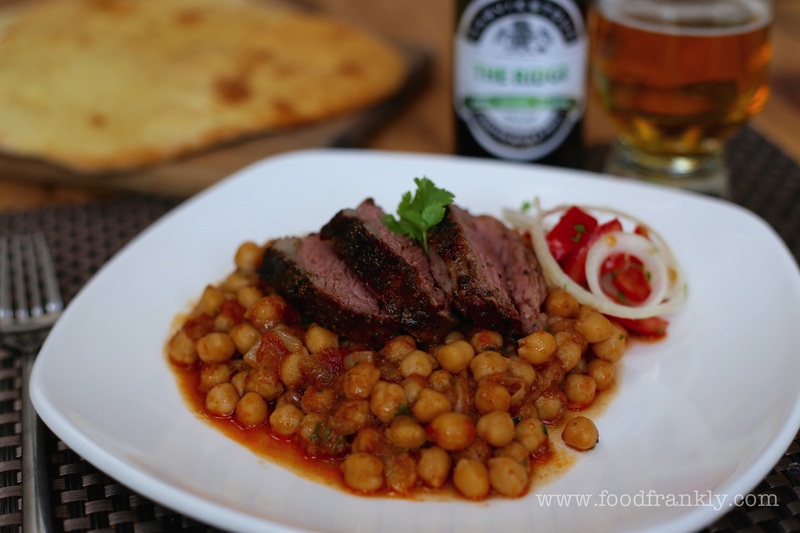 This entry was posted in Uncategorized and tagged atul kocchar, chanah ghost, chickpea, lam and chickpeas, lamb rump, naan bread, spiced lamb by Phil @foodfrankly. Bookmark the permalink. That looks delicious and I bet the lamb was great cooked on the barbecue! Fabulous!!! Doesn’t beer go so well with Indian food?!!! I’m must admit, I’m glad i tried this one Mimi. I’d say Indian food and an icy beer are pretty much the perfect partner! Unlike wine of course which is notoriously difficult to pair….